There's been a disaster in Unseen University. Well, two. Newly-appointed Master of Traditions Ponder Stibbons has uncovered that one of the University's oldest grants isn't quite as kind as they'd imagined (or simply not thought about): in fact, it requires that they partake in the city's football. Every year. But this wouldn't be a problem, if only the grant didn't support most of the cheeseboard - and a few other meals to boot. And Unseen University won't give up their food without a fight, even when it involves exercise. And then there's the other problem. The Dean, one of the largest (literally) presences in the staffroom, has become an Archancellor in himself - at another university. Even if it doesn't have banquets. Or much of a budget. But while Unseen University prepares for their turn to fight, the Patrician is playing a new game with equality - and Uberwald. 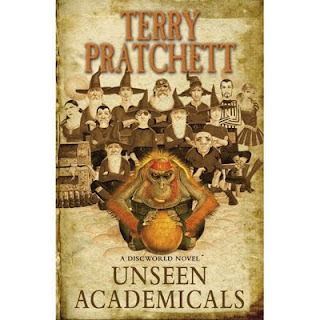 The anonymously anonymous Mr. Nutt has been sent to Ankh-Morpork, the largest city on the Discworld, and he, too, has been enlisted by the University. It's a fantastic satire with a message: for fashion, on equality, whatever Pratchett sets his pen to, it's literary gold. I don't need to talk about the prose, so instead let it suffice to say: it's brilliant. As for our cast, it's eclectic as always, although I'd have expected a little more of Rincewind. However, Dr. Hix thoroughly makes up for this, elucidating on his character from previous novels and making the "skull-ring" an in-joke. We've got appearances from a good deal of Ankh-Morpork's previous characters as well, among them William De Worde - all in all, it's a brilliant and insightful rentry to the Discworld, and well, well worth reading. Glad to hear you enjoyed this book so much. I have not got to read all of Terry's books but what I have read I have enjoyed them. I am going to have to add this one to the list. If I sit here reading a book about football my husband and son will be very happy. I watch football and can get into the game very much, particularly when my son is playing, but to read it is a different story. They will really enjoy that.